Russell Sturgis, writing in Sturgis' Illustrated Dictionary of Architecture and Building, defines a gargoyle as a: A water spout, ... projecting from a gutter and intended to throw the water away from the walls and foundations. 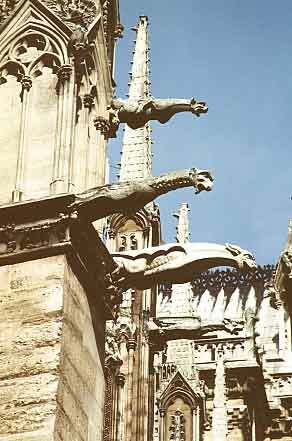 In medieval architecture, the gargoyles, which had to be very numerous because of the many gutters which were carried on the tops of flying buttresses, and higher and lower walls, were often very decorative, consisting, as they did, of stone images of grotesque animals, and the like, or, in smaller buildings of iron or lead. Many cultures throughout history have created sculptures of fantastic creatures. These figures stir our imaginations, as they stirred the imaginations of the carvers who lovingly created them. We struggle to understand and explain them, delving deep into the realms of psychology, culture, symbols, history and religion. One of the more common belief is that gargoyles served as protectors, keeping evil away from the buildings and their occupants. However, there seems to be much at work here and we can suspect that their reason to be, operates on a multitude of levels. Gargoyles can be traced back 4000 years to Egypt, Rome and Greece. Terra cotta water spouts depicting: lions, eagles, and other creatures, including those based on Greek and Roman mythology, were very common. Gargoyle water spouts were even found at the ruins of Pompeii. The first grotesque figures came from Egypt. The Egyptians believed in deities with the heads of animals and frequently replicated these deities in their architecture and wall paintings. When the Greeks saw the Sphinx, they began to incorporate grotesques into their own beliefs. The Greeks believed in many grotesques such as harpies, centaurs, griffins, and chimeras. Greek architects would often place statues of animals called acroterium, in the forms of griffins, at each corner of the roof of their treasuries and temples. In Greek mythology, griffins guarded the gold of Scythia from the Arimaspians, a race of one eyed giants or Cyclops, who would try to steal the gold. Adrienne Mayor, in her book The First Fossil Hunters: Paleontology in Greek and Roman Times, presents evidence that ancient legends of monsters may be based on the discovery, by pre-Christian nomads', of dinosaur bones in central Asia, hundreds of years before the birth of Christ. Mayor suggests; that the myth of the griffin, a winged lion with a birdlike beak, was inspired by the nomads' discoveries of fossilized bones of protoceratops, an animal that existed more than 65 million years ago. The book has thrilled paleontologists by showing that their science dates from ancient times, much longer ago than previously thought. Mayor shows that ancient Greek and Roman researchers collected numerous fossils of large extinct mammals and displayed them in temples and museums. "There they identified fossils as the relics of giants, heroes and monsters of myth," she says. Some ancient writers argued that the enormity of the supposed "human" remains proved the human race had since "degenerated" or "run down," becoming smaller and weaker. Mayor "has uncovered a barely noticed source for many of the myths of the Old World, and for the first time has assembled in an orderly way the evidence for early man's discovery of and explanations for fossil remains," says classical art historian Sir John Boardman of Oxford University. Thanks to her analysis, he says, many ancient "texts, sites, and pictures will never seem quite the same again." The ancient bones' biggest impact was on popular culture. For example, many ancient Greek vases of the seventh through fifth centuries B.C. 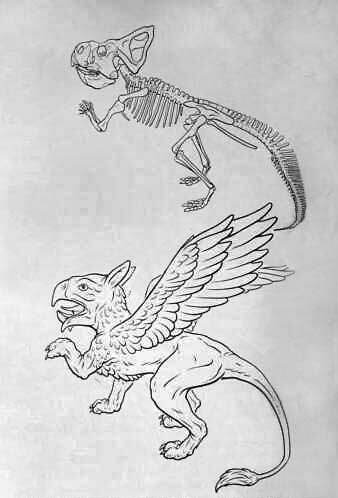 depict griffins. 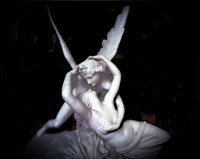 Gargoyles and grotesques have always given carvers and sculptors a chance to delight in their creativity and to explore the possibilities in the dance between stone and imagination. Gargoyles freed carvers from the limits imposed by other types of carving, and this was especially true in the Middle Ages. It is certain that stone carvers love creating these pieces, and viewers certainly love seeing them. This may be one of the more compelling reasons they exist. Francois Villon, a French writer in the late 1400's offered the following poem. The translation is from Ballade: As a Prayer to Our Lady in a collection of his known as The Testament as found in The Complete Works of Francois Villon. Ed. Anthony Bonner. 1964. p.68-69. who has never learned to read. one frightens me-the other gives me joy and happiness. filled with faith, without idleness or pretense. 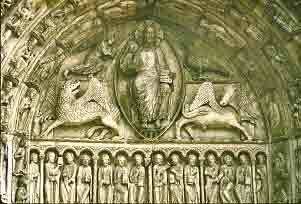 The cathedral also served as a "sermon in stone" which could be "read" by an illiterate population. Some gargoyles clearly fill this instructional purpose by illustrating Bible stories such as Eve's reach for the apple and frightening images of eternal damnation. Since gargoyles were on the outside of the cathedral and scenes of the Bible and statues of Jesus, Mary and the Saints where common inside the building, this represented God's power to protect the believers. They also represented the struggle between good and evil and symbolized how God was the only protection from evil in a fallen world. Gargoyles stand guard, warding off unwanted spirits and other creatures and If they're hideous and frightening enough, it was thought they would be especially effective in scaring off all sorts of other threatening creatures. Perhaps it was even believed that some came alive at night protecting people when they were most vulnerable. Better still, the ones with wings could fly and protect the village as well as the church. He smiles an early-Gothic smile. One of the most notable examples of Gothic architecture that incorporated many gargoyles and grotesques is Notre Dame cathedral, in Paris. It is interesting to note, that; once lead drainpipes were introduced in the 16th century there was no longer any practical need for gargoyles. However, architects and builders continued to incorporate them into their building designs, but now gargoyles served only a symbolic, spiritual, religious, decorative or whimsical purposes. Hindu Temples in India make extensive use of gargoyles in the form of the many Hindu Gods depicted on the temple structure. This image is from a Temple in Hydrabad and has hundreds of figures represented on its exterior. North America also has its fair share of gargoyles. They protect many of the older buildings in cities like New York, Chicago and Philadelphia. University campuses are also prime “habitats” for gargoyles with Princeton and Duke Universities, being a good examples. There are 6 gargoyles at the old Headquarters of the Philadelphia Fire Department at 1328 Race Street Philadelphia, PA. 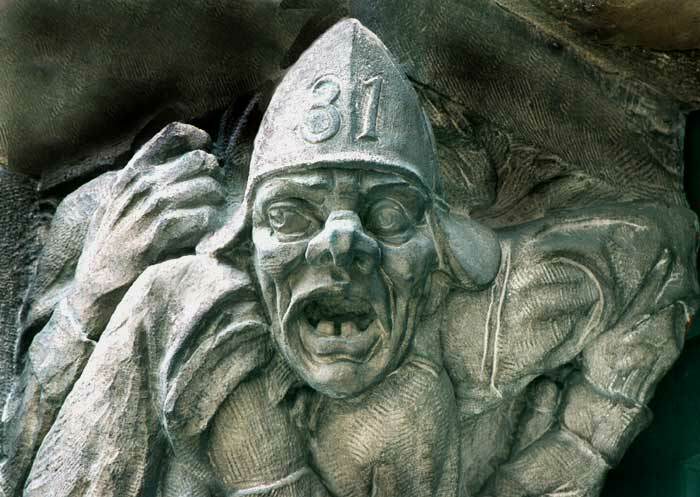 These whimsical characterizations are outstanding examples of the use of gargoyles in modern times and capture the essence of what it means to be a fireman. A very common image represented in the genre of gargoyles and grotesques is the Green Man. He is one of the most common figures and he stares down at us from the roofs, pillars and doorways of our great cathedrals and churches all over the world. The Green Man appears on second century Roman columns and in Hindu temples in India. He is found all over England, Wales and Scotland. He is present in the great banks and financial houses of Wall Street. His roots may go back to the hunters who painted the caves of Lascaux and Altimira. In one of his many manifestations as Robin Hood and the Morris Dances of Old England, he is chiseled in wood and cut into stone even to this day by men and women who no longer know his story but sense that something old and strong and tremendously important lies behind his leafy mask. One of the earliest English epic poems Gawain and The Green Knight may refer to another manifestation of the Green Man as the God that dies and is reborn This powerful theme of death and rebirth runs through all the diverse images and myths of the Green Man. In all, death and renewal are celebrated as the "Green" that represents all life. Medusa is another image that shows up frequently as a grotesque. The Gorgons were three sisters. Two of the sisters were monstrous with huge teeth, brazen claws and snakey hair. Sthenno and Eurayale were immortal, but Medusa, the third was mortal. Medusa, was a beautiful maiden who's hair was her crowning glory. She was loved by the god Poseidon in the temple of Athena. Athena was deeply angered and turned Medusa into a monster and changed her glorious hair into snakes. Athena made Medusa so ugly that that anyone who looked at her was instantly turned to stone. All around Medusa's cavern were stone figures of men and animals which had risked a glimpse her and had been petrified with the sight. Athena sent Perseus to slay Medusa, she lent him her shiny shield and Hermes lent him her winged shoes. Perseus approached Medusa while she slept and taking care not to look directly at her, guided by her image reflected in the bright shield, he cut off her head and gave it to Athena. In her ugliness, Medusa was the grand sculptor, a creator of gargoyles and grotesques, immortalizing their flesh by turning it into stone? The most likely truth is that all of these elements come together in explaining both the existence and our attraction to gargoyles and grotesques; the conscious, the unconscious, primitive religion, myth, Christian conversion, practicality and certainly the stone cutter's joy of creation. The images under consideration embody profound symbolic content from our "collective unconscious" and are significant and enduring symbolic manifestations of the human experience. Stephen King in his introduction to Nightmares in the Sky states: "...This is rather ironic, because the lady with the snaky hair-do is probably more famous for turning folks to stone than she is for becoming a piece of sculpture herself...which she did. Medusa, a creature too horrible for mortals to look upon, offers at least this cold comfort: in the end, she was too horrible to look at herself. She, that queen of nightmares with her writhing crown of snakes, become the world's first real gargoyle. Lester Burbank Bridaham, Gargoyles, Chimeres and the Grotesque in French Gothic Sculpture. Da Capo Press Series in Architecture and Decorative Art, Vol 21. New York : Da Capo Press, 1969. Fremantle, Anne. Age of Faith. New York: Time-Life Books, 1974. Sacheverell Sitwell, Gothic Europe.New York : Holt, Rinehart and Winston, 1969. Jay Jacobs, ed., The Horizon Book of Great Cathedrals. New York : American Heritage Publishing Co., 1968. Barbara G. Walker, The Woman's Dictionary of Symbols and Sacred Objects. San Francisco : Harper & Row, 1988. Mediaeval Culture." Online.Infoseek: http://web.lemoyne.edu/museums/ begieral/cult.html Nov.
John Harvey. The English Cathedrals. New York: Hasting House, 1956. Martin Hürlimann, and Peter Meyer. English Cathedrals. Boston: Houghton Mifflin Co., 1950. Janson, H.W., and Anthony F. Janson. History of Art. 5th Ed. Rev. New York: Harry N. Abrams, Inc., 1997.